American Miles for sale at 2.3 cents! American Airlines is again having a points sale with tiered bonuses on purchased miles via points.com. You can purchase miles here. Unfortunately Canadian residents will get tacked with HST/GST which brings the price up to around just under $1700 (for BC anyways where the soon to be scrapped HST is 12%). I think this is easily avoidable if you use a US credit card and temporarily “move” to the US. This for me does go beyond my ethical boundaries and it’s not something that I’m going to do as you risk getting your account getting closed (as this is probably against something in the T&C) but something that has worked for me is using my Hong Kong address (since my family has property there) and using a non-Canadian credit card. The best ratio for purchasing is 50,000 miles, with a 15,000 miles, which is a 30% bonus. This will cost you just over $1500. Unfortunately I don’t think I will be buying miles during this as I feel that the price is slightly too high, even at 2.32 cents per point simply because I have no need for the miles currently, so I can wait it out until SPG has a sale on purchased points which brings the cost per mile at just over 2.1 cents when transferred to airline partners. American has also had better promotions where points were sold at just over two cents each. I find this worth noting because this essentially means you can fly JAL First Class or Cathay Pacific First Class one way to Asia for essentially ~$1600 which could be comparable to purchasing a paid ticket last minute. This offer ends August 1st 2013. Purchased miles should post within 72 hours and bonus miles should post within 5 days. Meh, not worth the effort. This is poor promo. Period. 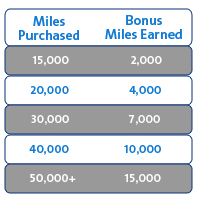 I’m hoping USDM has another 100% bonus (not targeted) because they will = AA miles in the future. How can you get Cathay Pacific 1st class from Canada to Asia for 65,000 miles, or $1,600? I’m finding biz class for $6000 and 1st class over $10,000. You’re buying 65,000 miles at $1600, and then you use those miles to book first and business class award space. Sorry, I was referring to round-trip, which I believe is minimum 110,000 miles. Plus there is a HUGE difference on Cathay Pacific between first class and business class. Yes, if you want roundtrip it would be double the miles, so just around $3200-3400. Sorry if I wasn’t clear enough. Where can I find first class (not biz) return fare on Cathay Pacific for $3,400? Use two accounts (maybe use your friend’s/family’s account) to purchase 65,000 miles each at $1513, and then redeem for a one-way from each account. You would need 67.5k though for Asia 2 so you could top it up by transferring miles from spg or another hotel program. 1513 x2 = ~$3500 max with taxes, airport fees, etc. Of course there would need to be award space for the dates you want. Sorry for the double tap.